I caught the collecting fever early on. My first collection was dolls, although I really only had one piece of note: A German porcelain doll head (pictured above) that belonged to my grandmother. It may have also belonged to my great-grandmother — family memories always get fuzzy. All I know is my gramma gave it to me. What made me a junior collector was the fact that I started buying books about doll collecting. I have a memory of my parents taking me to a doll hospital/doll museum to see other old dolls. 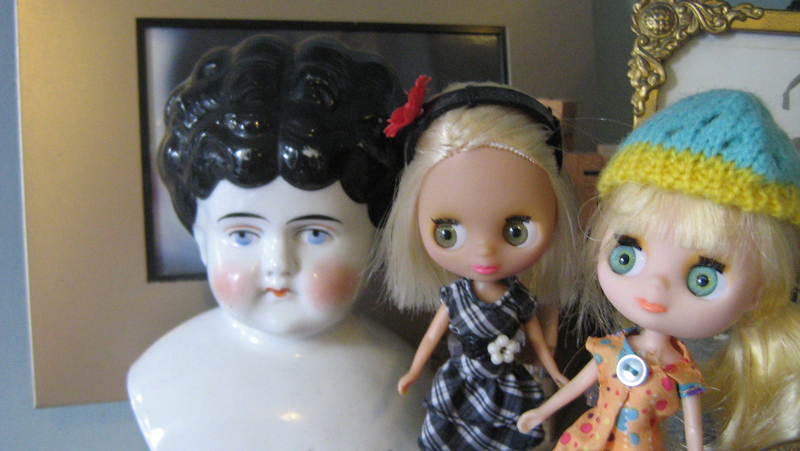 In my doll collecting days, I never got further than amassing a few modern “China” dolls. The head is the only example left from that era of collecting. I moved on to a brief flirtation with miniatures then it was on to a decades-long love affair with records. One doll that I had as a kid (and that mysteriously disappeared) was a Blythe doll. I won;t get into Blythe’s storied history here, but it is one of the three Proustian “madelienes” of my youth (the others both red shoes: a pair of clogs that vanished from my closet over the winter when I was 8 and my rubber Fiouricci Love Boots that went missing in action in high school). I bought these mini-Blythes to fill a small part of that nostalgia hole.